One lane has reopened on the A75 following a tractor fire on the road a mile west of Annan. The road was blocked earlier today in both directions because of the incident. Drivers are still advised to expect delays. Police are investigating a serious road traffic collision that occurred just before 5pm on Saturday 22 July 2017 on the A66. The incident occurred on the A66 near Threlkeld and involved a blue van and a yellow motorbike. The motorcyclist, a 29-year-old man, was airlifted to Royal Preston Hospital with serious, but not life threatening, injuries. The road was closed in both directions for several hours. Anyone with any information should contact PC 2367 Baker on 101 or Crimestoppers anonymously on 0800 555 111. A tractor and trailer loaded with slurry hit Ken Bridge at New Galloway this morning causing traffic problems and damaging part of the bridge. The A712 road into New Galloway has been closed and diversions set up. Police Scotland officers and Dumfries and Galloway Roads officials have been involved at the bridge where the north parapet has been damaged by the accident. A police spokesman said that further investigations will be taking place at the bridge. The A595 has closed at Moota following a road traffic collision. Emergency Services are dealing with a two vehicle incident on the A595 at Moota in the vicinity of Redmayne Junction. Police were called at 3.13pm today following the collision. The road has been closed and motorists are asked to avoid the area and use alternative routes via the A66 or A591/A592. You can visit the traffic link map to keep up to date with the latest situation on the roads. The overnight closures of the A590 near Greenodd have been cancelled again this weekend due to the weather. An article that appeared on our website detailing this weekend's planned closure has been amended to reflect the postponement. The B6413 will be closed between Lazonby and Kirkowald at Eden Bridge fro two weeks, starting form today (3rd June). The road closure will allow for the installation of permanent traffic lights. A signed diversion route will be in place via the A6 and Armathwaite bridge for the duration of the works. A walkway for pedestrians and dismounted cyclists will be maintained across Eden Bridge as well as access to the recycling area and Swimming Pool from Lazonby. 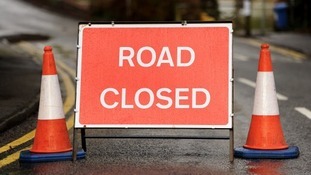 Cumbria County Council has apologised for any inconvenience that may be caused due to the road closure and says that due to the limited width of the bridge it is not possible to safely install the traffic signals while keeping the road open to vehicles. The A75 is currently closed between Annan and Dumfries and is expected to remain closed for up to five hours, after a road accident early this morning. The westbound diversion route is via A75 at Ladyfield, onto the B7020 to Dalton and Lochmaben, onto the A709 and then to the A75 at Dumfries. The eastbound diversion is the reverse route. Police are asking motorists to avoid the area if possible.